This set of magnifying lenses brings together three of the most popular magnifiers so you're readily equipped for any situation. This set of three magnifying lenses brings together the most popular magnifiers so that you're readily equipped for any situation. The frameless magnifier with a handle and 3x magnification enables holistic viewing of larger objects thanks to the especially large acrylic lens (diameter 90 mm, 3 1/2") and 2 white LEDs. The precision magnifier (lens diameter 21 mm, 7/8") provides high-resolution detail for the finest of details, thanks to its 10x magnification and 2 white LEDs. 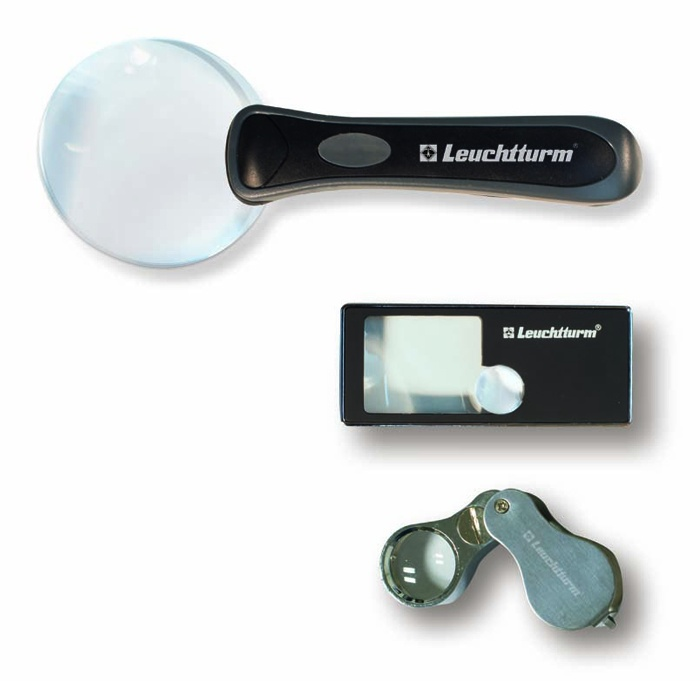 The compact pocket magnifier has 5 functions in one gadget: a large lens with 2.5x magnification (lens diameter 30 x 37 mm, 1 1/4 x 1 1/2"), a small lens with 10x magnification (diameter 15 mm, 5/8"), a UV lamp, LED pocket torch and a pull-out ballpoint pen. Due to its compact design, it's the perfect companion whilst travelling, shopping or visiting coin fairs.